This economical and handy pocket guide covers all the basics and more. 106 pages includes everything from formulas to therapeutic use of essential oils. Extensive information on over 165 of the most commonly available essential oils. The Complete Book of Essential Oil & Aromatherapy by Valerie Ann Worwood. $19.95 # pub-eoa This 419 page encyclopedic book has an abundance of information. Includes lots of recipes and essential oil charts. $14.95 # pub-ns Take the mystery out of soapmaking with advice and formulas for making quality soaps that are good for your skin. 182-pages. 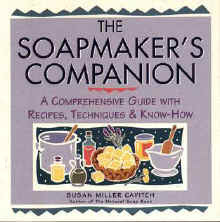 By the same author of THE NATURAL SOAP BOOK, this companion goes into greater detail about soapmaking. For the serious enthusiast. 279-pages. $14.95 # pub-ts The author demystifies the process of making "see-through" soap. Information and secrets are provided to make your own natural, luxurious transparent soaps. 145-pages. $ 12.95 # pub-ay This 121-page guide to natural skin care will give you tips and information about how to preserve your skin and health, personalize products, and give yourself a facial lift.